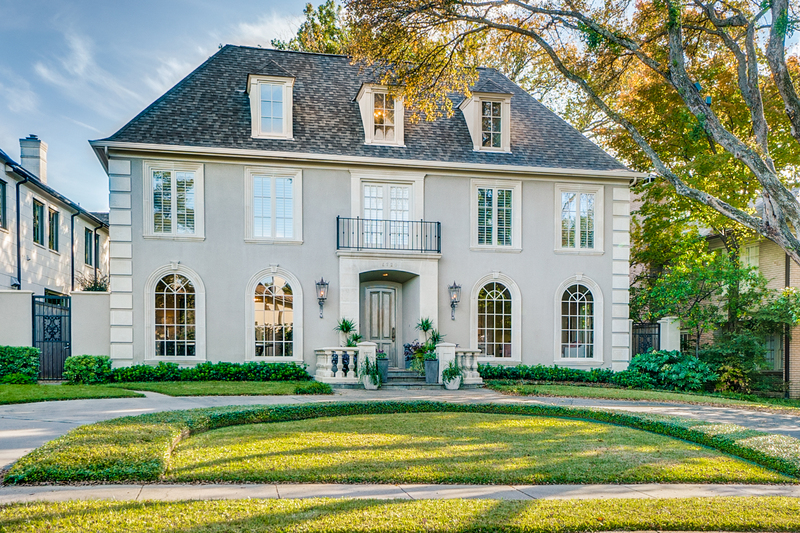 Situated in prestigious Highland Park and designed by renowned architect Larry Boerder, 4720 St. Johns Drive is a stunning French residence nestled on a 75’-wide frontage lot across from Hackberry Creek. With its stucco and cast stone exterior and swooping circular drive, the home has been newly refreshed and painted to a soothing light and bright palette and also includes a new roof and fence. Details include soaring 10’-foot ceilings downstairs, spacious gathering areas with elegant proportions, gleaming hardwoods, sculpted archways, deep molding, wrought iron detailing and fabulous marble and granite finishes throughout. Boasting sophisticated chic interiors, the fabulous three-story manse offers approximately 5,644 square feet, five luxurious ensuite bedrooms, 5.1 baths, an elegant central entrance hall with gorgeous marble-patterned flooring, exquisite formal rooms with circular windows, a spacious granite island kitchen with stainless appliances, a breakfast bar, butler’s and walk-in pantries and a large, light-filled morning room, a fully equipped utility room, oversized great room showcasing a cast stone fireplace and built-ins, an adjacent granite-topped wet bar and triple French doors conveniently opening to the outdoors, an oversized, luxurious master suite highlighted by a cast stone fireplace, sitting area, His and Hers large walk-in closets, and a fabulous marble bath appointed with His and Hers vanities, a vanity desk, jetted tub, separate double shower, toilet room and a refrigerator, and four additional generous-sized ensuite bedrooms featuring large closets and elegant baths, including a third floor bedroom which may also be used as a spacious game room. Outside, the backyard grounds set the tone for a sophisticated atmosphere for entertaining. Marked by columns, the covered terrace is highlighted by brick-patterned flooring, sound system speakers and ceiling fans and also overlooks the huge verdant landscaped grounds. A detached two-car garage with guest quarters above completes this stunning residence. The guest quarters reveal a spacious vaulted living room-bedroom with neutral carpeting, a large closet and an elegant full bath.